The sixth book of the Narnia series is very different from the first five. In every other book there’s at least one character who is transported to Narnia (or the surrounding fantasy kingdoms) from our Earthly world. They each became a character for readers to relate to, suddenly transported to a foreign land, unaware of the ways things work and what’s good and what’s evil. In this book, the main character is a young boy named Shasta, originally from Narnia, but living in another land called Calormen as a slave. Because of this slight difference, The Horse and His Boy is actually one of the best of the Narnia books. The story behind the book is even more interesting though. Books three, four, and five of the series are known as the Caspian trilogy, because all three books focus on the Prince (later King) of Narnia – Caspian. While writing those three books, C.S. 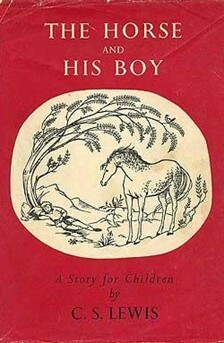 Lewis took a break and wrote The Horse and His Boy. So, if you number the books in the order they were written, this one is fourth. However, since Lewis didn’t want this story to come out in the middle of the Caspian books, he kept it on his desk and didn’t publish it until fifth. But, since he’d already written it, he gave a little sneaky shout-out to Shasta and the horse Bree in Book Four – The Silver Chair. 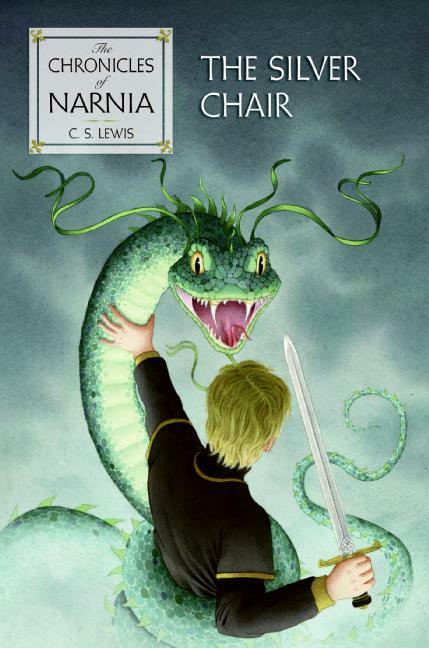 The Silver Chair takes place thousands of years after The Horse and His Boy, but some of the characters in The Silver Chair make mention of a famous legend in Narnia of Shasta and Bree. Lewis was able to make this reference to a piece of fake Narnian history, because he’d already written the story. Much like J.R.R. Tolkien did with his Lord of the Rings world – MiddleEarth – Lewis gave Narnia it’s own history, mythology, and cultures to make it more real to readers. I thought this little story was the best part of the book. As a whole, it’s a fun adventure story, but not great by any means. I wouldn’t recommend it to anyone unless they were trying to read the whole Narnia series. I did like that after three books that took place several thousand years after the original story (The Lion, the Witch, and the Wardrobe), this one went back to the time period of the first book. Also, after a few books without them, it was fun to catch the little references to Peter, Edmund, Susan, and Lucy – the heroes of book one and book two. So far, I’m giving this series 3 out of 5 stars. This book gets 3 1/2 stars. Each year I challenge my students to read 40 books over the course of the school year. I believe I can’t ask the kids to do something I’m not willing to do myself, I take the challenge to. In fact, this year I’ve challenged myself to read 60 books. The Horse and His Boy was the 5th book I’ve read this school year. I seem to be on a real big graphic novel kick lately. I really enjoyed Smile by Raina Telgemeier, the Babymouse series has quickly become one of my favorites, My Friend Dahmer was one of the most memorable books I’ve read this year, and Bone has shot to the top of my all-time favorites list. Not to be forgotten is the Amulet series. These books, by Japanese-American author Kazu Kibuishi, are among the best fantasy adventures I’ve ever read. The story starts out in an amazing fashion with one of the best hooks in the history of books (I reviewed book one about a month ago), but it’s gone so far that it’s hard to remember how simple things were for the book’s brother and sister heroes – Navin and Emily – back then. The story begins with the kids moving, along with their mom, to a creepy old house that has been in the family for generations, but was last inhabited by their great-grandfather, the eccentric old Silas. The mom’s scraping to make ends meet and at her wit’s end, so she moves her family into the house, because the free price tag is all she can afford. Before they’ve even spent an entire night there, a spooky ghosty octopus-demon thing snatches mom away, taking her to another world/dimension. Emily and Navin follow, Emily wearing an amulet the kids found while snooping around, and they soon learn that Emily is what is known as a stonekeeper, a person that can connect with the stone in the old amulet to perform some incredible feats of magic. They go after their mother, while the evil prince of the elves tries to stop them, and before long they meet that eccentric, long-lost great-grandfather and an odd assortment of good guys, like the robot bunny, the tin-man engineer, the ninja fox warrior, and the old man/cat person that pilots a blimp/plane. By book four, which is how far I’ve gotten so far, you’re in a totally unique world with its own set of rules, wondering if the good guys are bad and the bad guys are good, because the author throws some incredible twists and turns at you in every chapter. I don’t know how long this series will go on, but it’s got me hooked, because it’s one of the best fantasy stories I’ve ever read. To top it off, the art work is unbelievable. In each book there are three or four sections where Kibuishi changes things around – instead of five or six little panels on a page, he makes a few giant pictures that go across two whole pages – these ones make you stop and stare for a while. The imagination, the artistic talent, the incredible storytelling…. Amulet has it all. I’ve got book five on hold at the public library, and I can’t wait ’til it comes in. Way back in the day, great stories were written in the form of epic poems. The Iliad told the story of the Trojan War – a decades long battle started when the Trojan prince, Paris ran off with Helen, the wife of a Greek King. The Greeks invaded Troy, resulting in a war that lasted 20 years and destroyed an entire civilization. After that war ended, one of the Greek generals, Odysseus, tried to go home. The Odyssey told his story, and how he incurred the wrath of the god Poseidon and secured the aid of the goddess Athena who battled with one another to prevent him from getting/help him to get home. Along the way he fights monsters, storms, and curses for years and years. The Epic of Gilgamesh is the story of a Mesopotamian King. Beowulf tells the tale of a fierce Norse warrior called upon to save his whole society. The legend of King Arthur, the fictional king that was said to unite all the tribes of great Britain, is another epic tale. The common thread among all these stories are fantastical adventures that cover vast place and time. In more recent times, stories like Harry Potter, His Dark Materials, The Chronicles of Narnia, The Hobbit and The Lord of the Rings, Redwall, and more for adults, The Dark Tower and A Game of Thrones have all been called modern day epics due to the incredible scope, fantastical characters, and exciting adventures in each of these tales. I’m going to argue that one more story should be added to this incredible list – Bone. 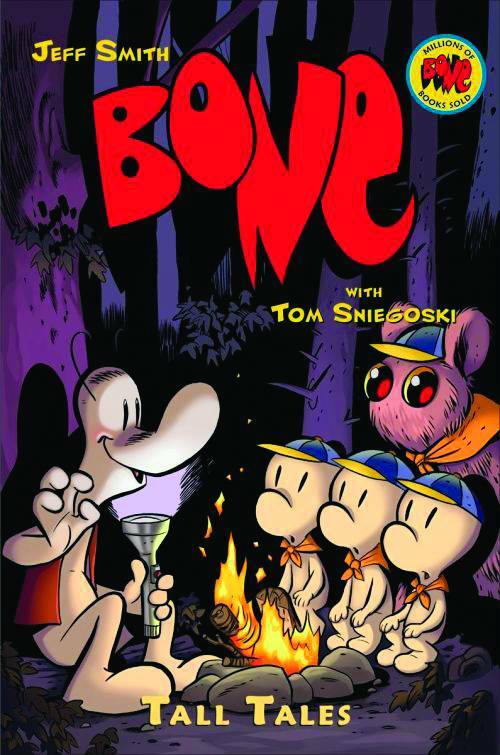 Some people look at the Bone graphic novels and immediately discount them as “little kid” books, because the main characters look like silly kids’ cartoons. And it’s true – Fone Bone, Phony Bone, and Smiley Bone are goofy and cartoony – at least in the beginning of the nine book series. Don’t let that fool you. They still have exactly what it takes to be great characters. The three Bone cousins are up there with Mickey, Donald, and Goofy or Bugs, Daffy, and Porky, or even Frodo, Samwise, Merry, and Pippen from The Lord of the Rings. Fone Bone is the Mickey/Bugs. He’s serious, he’s normal, and he’s loyal. Phony is Donald/Daffy Duck – he’s angry, he’s temperamental, and he’s selfish. Smiley Bone is just like Goofy or Porky – he’s happy, he’s silly, and he’s there for comic relief. Now just imagine that Mickey, Donald, and Goofy find themselves in Middle Earth fighting the forces of evil for the future of mankind. That’s Bone. These cartoony cousins have somehow stumbled into another world, a world in which an evil being called the Lord of the Locusts is trying to take over. There are incredible bad guys, treacherous journeys, daring rescues, perilous battles, and all the other things great epics need – evil villains; a chosen one growing into their role as hero; mystical animals like dragons, giant mountain lions, and the horrible rat creatures. Over the course of the 9 books in the series (plus a prequel story called Rose and a supplement called Bone: Tall Tales), you get as much drama, action, adventure, mystery, and good vs. evil as you do in Lord or the Rings, Gilgamesh, Beowulf, or Harry Potter. 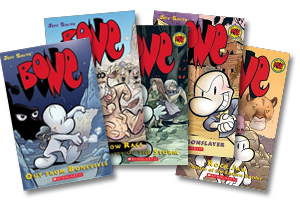 Like any great story – epic poem, graphic novel, or prose story – the only bad thing about the Bone series is that it had to end. It’s a great ending, but I would have loved 9 more books instead. Thank goodness some one else agrees, because there’s now a new Bone series – new characters and a new adventure in a series of illustrated novels (think Diary of a Whimpy Kid or Wonderstruck) called Bone: Quest for the Spark. Those new books are definitely on my “to-read” list. There’s Harry Potter, The Lord of the Rings, The Chronicles of Narnia, The Once and Future King, and countless other fantasy novels that can lay the claim to the “be all end all,” the best of the best, the one series that defines the genre. 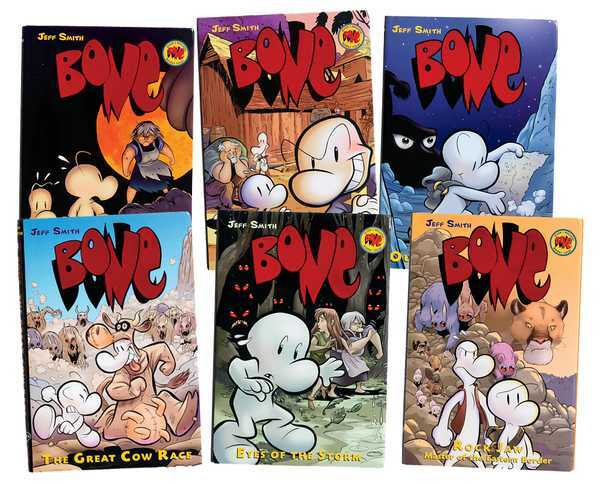 I’m here today to ask people to consider Jeff Smith’s epic graphic novel series Bone for that title as well. The world of Bone is every bit as detailed, well thought out, and endless in scope as Narnia. It’s heroes, the Bone cousins (Fone, Phoney, and Smiley) are as fantastic as Frodo and Samwise. The reluctant “Chosen One,” Thorn, is as compelling as Harry Potter, Luke Skywalker, and Neo from the Matrix. Plus, unlike most of those other stories, Bone also has some hilarious moments. I haven’t finished the 9 book series just yet, but the first 6 books make up the first two of three trilogies that tell the entire story of Fone Bone, a marshmallowy looking creature who, along with his scam-artist cousin Phoney and his goofball cousin Smiley, stumble into “the valley,” a world of mythological monsters and medieval villages. The cousins are separated at first, finding themselves in an ancient world on the verge of war. A mysterious hooded figure is trying to awake evil spirits of the past, aided by the rat creatures, a vicious breed of carnivorous monsters. The Bones are befriended by the last remaining humans in the valley, including Thorn, a beautiful, but sad heroine, Gran’ma Ben, and Lucious, the owner of the Barrelhaven Tavern. As the story unfolds, more bad guys show up, twists and turns abound, and the characters become some of the strongest ever seen in the fantasy genre. So far, I’ve read Bone 1-6. They were the 80th, 81st, 83rd, 87th, 88th, and 90th books I’ve read this summer. I have three more Bone books to read to finish Bone’s quest, but my quest to read 90 books in 90 days over summer break is over. The first three books in the Narnia series focused on the Pensevie siblings: Peter, Edmund, Susan, and Lucy, in the first two, and Edmund and Lucy in the third, but C.S. Lewis left the Pensevies back at home for the fourth book, The Silver Chair. In fact, for the first time in the series, there’s hardly any connection to the previous books. Eustace Stubb, the cousin of the Pensevies is back, but he’s a completely different character, having grown and changed during his adventures in The Voyage of the Dawn Treader. Prince Caspian, now King Caspian, and Trumpkin the Dwarf are also back, but only as very minor characters in the background, and they’ve gone from adventurers to a feeble old men on the verge of death. Narnia’s all new, and actually, most of the story takes place in other worlds around and underneath Narnia. This has so much potential, it’s tough to stomach how weak the story turns out to be. It could have been so cool. 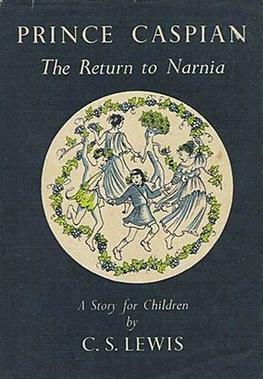 In this story, Eustace and his schoolmate, Jill Pole, are called to Narnia by Aslan to find Prince Rillian. The prince had disappeared nearly a decade earlier, after the sudden death of his mother, and with King Caspian fading quickly, the prince is needed or, without leadership, Narnia will fall apart. Eustace and Jill are given a series of signs to look for that will aid them in their quest, but they have a difficult time following directions and miss most of the signs, continuously finding themselves in trouble. Along with Puddlegum, a new character from a race of people called Marshwiggles (that’s there to replace the Beavers from book one and fan favorite, Reepicheep the mouse, from the next two, but doesn’t do it well), the two children blunder through their mission and find Rillian despite the constant mistakes. A bit about Puddlegum, who may be the worst part of the book. When the Star Wars prequels came out everyone complained about Jar Jar Binks. He was no Chewbacca. He was annoying. There for comic relief, he was not funny. George Lucas took a ton of flack for this character. Well, he should have read the Narnia books, because in books 2 and 3, Reepicheep the Mouse was a favorite of almost every reader – he was brave, drove the action, and we, as readers, cared about him. In this book, Reepicheep is hardly mentioned, and since the action takes place decades after the last story, he’s presumed to be long dead – big mistake. Puddlegum becomes the sidekick, and with his webbed feet and scaredy-cat ways, he’s an awful lot like Jar Jar. Puddlegum is a complete downer, always looks at the worst possibility… let’s just say some people believe a glass is half empty and some believe it’s half full, but when it comes to Puddlegum, all the people just want to throw the glass at his stupid face. At times, this one is the best of the series – new races of people, new worlds, new legends, new creatures – but at other times it’s the worst – it seems that Lewis has run out of good ideas through a lot of the story. Overall, it’s an enjoyable story, but took me much longer than the first three books, because I never felt very attached to the characters or compelled by the story. Perhaps it was a mistake to take away all the characters we loved in the first three books. I truly believe that if the children had been given a better sidekick than Puddlegum, this could have been the best of the series instead of the worst. I’m going to keep reading the last three books, but I sincerely hope they get back to the excitement of Prince Caspian and The Voyage of the Dawn Treader, because if they keep going downhill it’s going to be rough. The Silver Chair was book #66 for me this summer on my quest to finish 90 books in 90 days. Okay, what’s the deal with the whiners? The Voyage of the Dawn Treader is the third book in the Narnia series that I’ve read this year, and it’s the third book to feature an intolerable little brat as one of the main characters. In the first book, Edmund (the younger brother) is a whiny, obnoxious thing that betrays his siblings for some candy. Halfway through the story he repents and becomes nice. In the second book, Prince Caspian, the oldest sister, Susan – who was rational and normal in the first story – is so bossy that you wish she’d pop out of the page long enough for you to smack her a little. Now, in the third book, the cousin of the four siblings, Eustace Stubb, is the whiniest, brattiest character ever. Of course, these sorts of characters are part of what makes the books so good. C.S. 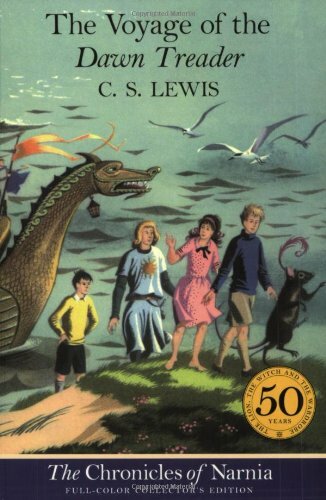 Lewis had trouble getting you to really care about his protagonists (in the first book, Susan, Lucy, and Peter have zero personality, and in book two, Prince Caspian, Peter, Edmund, and Lucy are non-characters), but he really gets you to like/dislike some of the other people in the book. Eustace is a great character. You want to smack him. You want him to fall off the boat. You want a sea monster to eat him. Reepicheep, a two foot tall talking mouse, is one of may favorite characters in the series so far – he’s hilarious, and you root for him to feed Eustace to the sea monster. This time around, the younger siblings (Edmund and Lucy, along with cousin Eustace) are sucked into a painting of a Narnian ship in Eustace’s house. They find themselves on a sea voyage with Prince Caspian, who Lucy and Edmund met in book two. Caspian’s father was murdered by his uncle, so the uncle could take the Narnian throne. When he did this, the older Caspian’s chief counselors left Narnia. Now that the throne is back in the right hands, Caspian has enlisted a crew and set out to find his father’s trusted men. The book almost reads like a series of short stories, each one a different adventure Caspian and the children undergo during their quest. The variety, as well as the fun characters, make it a much better story than the first two books. So far, the Narnia stories are no where near as good as Harry Potter, The Lord of the Rings, or Percy Jackson, but they are fun, quick stories that are worth reading. The Voyage of the Dawn Treader puts me at 52 books so far this summer as I try to finish 90 books in 90 days. The Narnia series is all messed up. C.S. Lewis wrote the books in a particular order. With each volume, he didn’t really know that there would be more. The first three books he wrote go in chronological order, but after that, there’s some prequel stuff, some sequel stuff, and other stuff that just fits into the Narnia world, but doesn’t 100% connect with the main characters of the first three books he wrote. So, I just finished the second book, Prince Caspian. Wait a second, some folks say that I just read the fourth book in the series and that the book that I thought was first is actually second, and now I’ve really skipped books one and three. You see, for the longest time, the books were numbered in the order that Lewis wrote them. Even though the story takes place in a different order, they remained numbered by the date of publication. I guess some people without a whole lot to worry about other than silly trivial things like the number on the spine of a children’s fantasy story wanted them to be renumbered in the chronological order that the stories take place. Both sides have valid points. In The Lion, the Witch, and the Wardrobe (the first book according to the publication dates) Lewis describes the fantasy world of Narnia like the reader had never seen it before, but he doesn’t do that in The Magician’s Nephew, which was written 6th, but actually takes place 1st. That leads you to believe that the publication dates are the correct order. However, some little kid wrote Lewis a letter in 1957, saying that his mother thought the books should be numbered in the order they were written, but the kid felt they should be renumbered to match the chronology of the story. C.S. Lewis wrote back, sort of agreeing with the kid, but also remarking that he didn’t think he was writing a series and that it might not even really matter what number is what. Regardless, if you’re reading the Narnia books published before 2005, they’re numbered in order of publication. If you’re reading newer copies, they’re numbered by story chronology. That said, I’m reading them in publication order, so Prince Caspian is the second book for me. I enjoyed this one. I had some issues with The Lion, the Witch, and the Wardrobe, because it was very vague, skimming over what I thought were important details, and speeding through what should have been the exciting action scenes. I think that the movie version, which I really liked a lot, ruined TLTWATW for me. Now, having read another Narnia book, I get Lewis’ writing style a little better. He’s not writing long drawn out, detailed stories like Harry Potter or The Lord of the Rings. He knew his audience was much younger than that, and he wrote for them. He got to the point. I said in my review of Lion that I wished I’d read it as a kid, and now that I’ve finished Prince Caspian, I really wish I’d read the whole series earlier. Prince Caspian takes place 100s, maybe even 1,000s of years after Lion did. The title character is being groomed by his uncle, the King of Narnia to take the throne some day. Then his uncle has a son, and Caspian learns that now that his uncle has a real heir he intends to kill Caspian, just as he killed Caspian’s father years before. Caspian runs, hoping to flee to safety. What he finds is Old Narnia is alive and sort of well – he’d always heard the stories of talking animals, walking trees, and mythological beasts of the past, and even though everyone else thinks they’re just stories, Caspian believes. He was right. He befriends a badger and two dwarves, who help him build an army of bears, mice, centaurs, giants, and squirrels. They’re no match for the king’s army, so Caspian calls for help. Enter Peter, Susan, Edmund, and Lucy, the four protagonists from the first (or second) book. The former kings and queens of Narnia enter the fray to aid their new friend. I liked this one much better than the first one (except Susan, I kinda wanted to punch her in the face). The action is stronger, the characters better developed, and the story more complex. Now I want to see the movie. I’ve now read 45 books this summer, which puts me half way through my quest to read 90 books in 90 days during vacation.